Transit Riders Council: outrage that Ratner "will receive substantial concessions at the expense of... the public at large"
The big news in the past day or so concerning Atlantic Yards has been the apparent interest of Russian billionaire Mikhail Prokhorov in buying into the Nets and the Barclays Center. Even if Prokhorov's offer emerges as solid, thus generating even more headlines, all it does is save Forest City Ratner's arena plan, providing (presumably) sufficient capital to help build the country's most expensive arena. It doesn't change the plan to decrease, rather than increase the size of the new Vanderbilt Yard. Nor does it change the Metropolitan Transportation Authority's agreement to accept $20 million, rather than the initially pledged $100 million, from Forest City Ratner, and to give the developer 22 years to pay the rest, at a generous 6.5% interest rate. This document has been prepared to address comments directed to ESDC and, therefore, does not address comments related to the MTA approval process. Except the New York City Transit Riders’ Council (NYCTRC), the legislatively-mandated representative of transit riders, submitted a letter (below) expressing outrage at the concessions to the developer, and argued that the ESDC was acquiescing in providing those concessions. 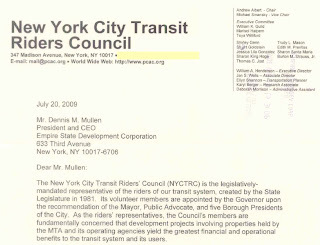 At its 6/25/09 meeting, according to board minutes, the criticism was even more harsh, despite defense of the deal by visiting MTA board member Doreen Frasca. And another council member, echoing criticisms of a project that would contain some 3600 parking spaces but be called transit-oriented development, said the MTA missed an opportunity to require less parking. Trudy Mason noted that earlier in the meeting she had put forth a motion, which was unanimously passed by the members, expressing concern about the deal that had been approved by the MTA Board the day before. She said that in the past the MTA did not allow itself to be held up by developers. She noted that there were a whole host of Brooklynites and elected officials who spoke out against the project. Ms. Frasca noted that no deal is perfect and that she respects that not everyone supported the final deal. She said that a functioning rail yard has a very different value than a piece of empty land. She also understands the costs associated with a development project of this nature. She said that the asset value has been reduced and that the arena parcel is now valued at $20 million with the right to purchase MTA-owned air rights as needed for future development phases. She said the most important thing is the rail yard and ensuring that it is included in this deal and that its design will provide for a high level of service. Ms. Mason noted that the MTA allowed Mr. Ratner to arrange the necessary funding and proceed with a project that is not what was originally proposed. She noted that Mr. Ratner has received everything he sought without paying enough for it, including the naming rights. He was also essentially given 20 years to see if he could get the development completed. Tom Jost noted that the MTA handled this deal strictly as a transportation entity. He said if the development is to be built, there need to be restrictions that cause the development to be more carbon neutral and to provide less parking. The MTA should have taken the opportunity to create a paradigm shift. Ms. Frasca agreed that this was missed opportunity. The New York City Transit Riders’ Council (NYCTRC) is the legislatively-mandated representative of the riders of our transit system, created by the State Legislature in 1981. Its volunteer members are appointed by the Governor upon the recommendation of the Mayor, Public Advocate, and five Borough Presidents of the City. As the riders’ representatives, the Council’s members are fundamentally concerned that development projects involving properties held by the MTA and its operating agencies yield the greatest financial and operational benefits to the transit system and its users. At our last New York City Transit Rider’s Council meeting, the Council members expressed their deep concern with the changes to the Atlantic Yards project that are incorporated in recently adopted amendments to the 2006 Modified General Project Plan for the Atlantic Yards project. The Council members are deeply troubled by these changes as they believe that they have fundamentally delayed and diminished a wide range of public benefits flowing from the project. As a result the NYCTRC voted unanimously to go on record expressing its dissatisfaction with the revisions to the project. In the discussion of the project, several members of the Council expressed outrage that the project developer, the Forest City Ratner Companies, will receive substantial concessions at the expense of the interests of the public at large and that the Empire State Development Corporation, as well as the Metropolitan Transportation Authority, is acquiescing in providing these concessions. The Council is particularly concerned with proposed changes in the schedule and potentially in the scope of the project that are connected to the decision to allow acquisition of the project site in phases. An important part of the public benefit that was to flow from the project was the payment for real property and other development rights to be made to the Metropolitan Transportation Authority (MTA). These funds were to form an important part of the funding for the MTA’s capital improvements, thus producing further benefits for the community at large. In the earlier proposal submitted to the MTA by the developer that was to form the basis for working out a final agreement, these funds would have been paid to MTA in the initial phases of the project. Under the revised phased structure of the project, however, only 20 percent of the value of MTA property interests will be paid up front. The remaining 80 percent is to be paid in a set of installments with due dates that stretch until the year 2030, under terms that we view as extremely favorable to the developer. The proposed Atlantic Yards development plan establishes a schedule that will allow the project developer to make the last installment of the 80 percent of the total sum due to the MTA in 2030. While it is not within the purview of this Council, we would also note that the proposed changes to planned improvements for the Vanderbilt Yard will foreclose certain options for LIRR Brooklyn service. In particular, these change will significantly reduce the capacity of the yard and reduce the number of tracks available in the yard. We respectfully request that you reconsider the pending amendments to the Atlantic Yards General Project Plan in light of these concerns.